VANCOUVER, Nov. 22, 2018 /CNW/ - NexGen Energy Ltd. ("NexGen" or the "Company") (TSX: NXE, NYSE MKT: NXE) is pleased to report geotechnical and radioactivity results for twenty-nine holes comprising 20,482.31 m on the Company's 100% owned Rook I property, in the Athabasca Basin, Saskatchewan. 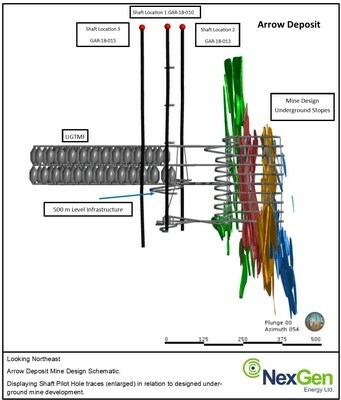 The primary objective of the program was the geotechnical characterization of areas within Arrow's footwall, lateral development and potential underground infrastructure locations of which results were incorporated into the Pre-Feasibility Study ("PFS") released on November 5th, 2018. The exploration results of this release which encountered strong mineralized intervals in key areas were not incorporated into the updated Mineral Resource Estimate and PFS results, released on November 5, 2018. Holes targeting the footwall successfully characterized the geotechnical and hydrogeological conditions of the rock-mass proximal to the potential mine infrastructure and Underground Tailings Management Facility ("UGTMF"). Additionally, drilling focused on the sterilization of uranium mineralization within areas that will host project development infrastructure and were all geotechnically logged incorporating packer tests at regular intervals. Leigh Curyer, Chief Executive Officer, commented: "The successful completion of the geotechnical and hydrogeological drilling was highly positive and reflected in the Arrow Project PFS released on November 5, 2018. 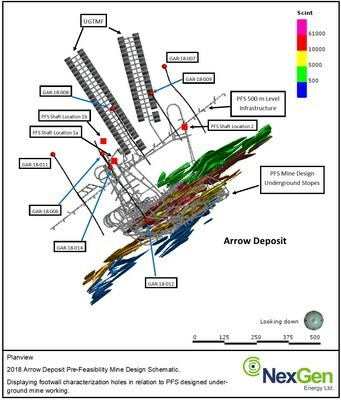 In addition, the exploration results at Arrow this last summer continue to provide strong upside with respect to areas of potential future resource growth. These results have positively set the foundation for our largest campaign to date at Arrow - a two staged 125,000 m drill program commencing mid-December 2018 through to Q3 2019. The results of this program will then be incorporated into a Feasibility Study scheduled to be released in H1 2020." Troy Boisjoli, Vice-President, Operations and Project Development, commented: "The Summer 2018 drill program demonstrated the highly competent geotechnical chartateristics of the Arrow deposit. The team is looking forward to the approaching 125,000 m drill program to further advance and optimize Arrow's potential mine development profile. 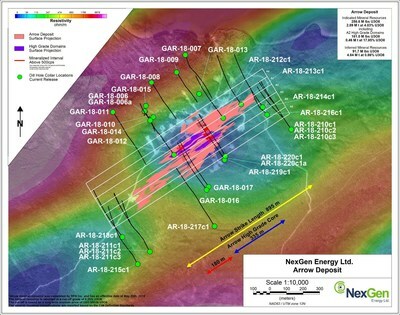 Further, the high grade mineralization encountered northeast of the A2 High Grade Domain is a great result providing additional areas to test in the future for potential resource growth." 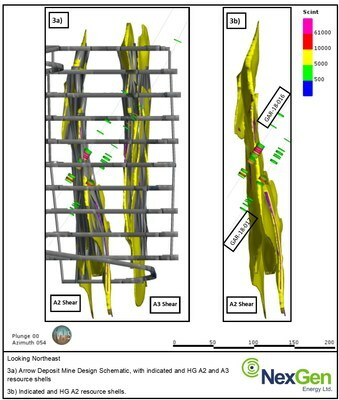 For details of the Rook I Project including the quality assurance program and quality control measures applied and key assumptions, parameters and methods used to estimate the Mineral Resource please refer to the technical report entitled "Technical Report on the Preliminary Economic Assessment of the Arrow Deposit, Rook 1 Property, Province of Saskatchewan, Canada" dated effective September 1, 2017 (the "Rook 1 Technical Report") prepared by Jason J. Cox, P.Eng., David M. Robson, P.Eng., M.B.A., Mark B. Mathisen, C.P.G., David A. Ross M.Sc., P.Geo., Val Coetzee, M.Eng., Pr.Eng., and Mark Wittrup, M.Sc., P.Eng.,P.Geo. each of whom is a "qualified person" under NI 43-101. The Rook I Technical Report is available for review under the Company's profile on SEDAR at www.sedar.com. A technical report in respect of the PFS will be filed on SEDAR (www.sedar.com) and EDGAR (www.sec.gov/edgar.shtml) within 45 days of the PFS news release (November 5th, 2018) providing details of the Rook I Project including the quality assurance program and quality control measures applied and key assumptions, parameters and methods used to estimate the Mineral Resource.